Christmas is a time to spend with your loved one, fluffy or not, so you don’t want to be spending your valuable free time or extra pennies at the vets. There are many things to avoid preventing an unwanted and possibly expensive trip. Grapes and raisins: Grape and raisins rich foods such as the traditional Christmas cake are extremely poisonous. They can cause kidney failure from even a small amount if left. Onions, garlic and other members of the allium family: Any members of the allium family can start with vomiting and diarrhoea but can cause severe damage to your pet’s red blood cells, leading to anaemia. Alcohol: Like us, alcohol causes drowsiness and incoordination but it can be far more harmful to your fluffy ones. Alcohol reduces body temperature and blood sugar, which can lead to comas. Nuts: Nuts, especially macadamia, can be poisonous to dogs. It causes lethargy, increase in body temperature, tremors lameness or stiffness. Chocolate: Chocolate is one of the most common poisoning cases seen in veterinary practices. Like with children, it can agitation and hyperactivity but, unlike with children, it can be very dangerous. Chocolate ingestion can cause tremors, convulsions and heart irregularities. Artificial sweetener/Xylitol: Artificial sweeteners such as xylitol, often found in chewing gum, can be extremely toxic which leads to liver damage. The xylitol causes insulin to be released into the body, reducing the blood sugar levels and can cause vomiting, lethargy and convulsions. The signs can be rapid or delayed. Fatty Foods: Fatty foods are everywhere during Christmas but they can make pets very ill. Fatty foods can cause pancreatitis, vomiting and diarrhoea. Mouldy food: Much like with people, mouldy food can be very dangerous especially mouldy diary, bread and nut products. It can cause vomiting, diarrhoea, muscle tremors and seizures. Poinsettia: A popular decoration for Christmas time can cause irritation to the mouth and stomach if eaten. It can also cause vomiting and hypersalivation or drooling. Holly Berries: The berries are, thankfully, not that toxic but can cause stomach upsets if eaten. Mistletoe Berries: The European version isn’t very toxic but, similar to Holly berries, can cause stomach upsets if eaten. However, the American version is high toxic. Ivy: The Hendra Helix Ivy version causes skin irritation if your pets are exposed to it for a prolonged period of time. Lilies: Lilies are highly poisonous to cats causing gastrointestinal issues, fits and heart arrhythmia. Ingestion of lilies can be fatal to cats if not treated. Decorations and Toys: Baubles and toys lying around the house can be a massive problem at Christmas time. 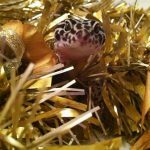 The main issue is obstructions and foreign bodies which can be extremely costly but glass baubles and decorations can also shatter or be chewed, causing damage to the inside of your pets’ mouthes and gastrointestinal system. Bones: Turkey bones seem like a good little treat for your dogs and cats but, if shallowed, they can cause internal damage such as obstructions and perforations to the gastrointestinal system. This can cause your pet to become severely ill or can be fatal. Antifreeze: Antifreeze is a huge problem for cats during the winter months. The taste of antifreeze is apparently delicious to cats but it can be fatal if ingested. It causes weakness, vomiting and diarrhoea and, if left untreated, kidney failure. 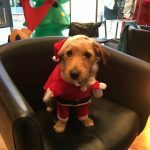 Hopefully this will help you avoid an unnecessary trip to the vets over the Christmas period and let you enjoy all your free time with your furry and non furry loved one. 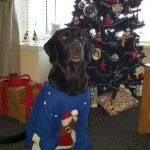 From all at Gilmoor Vets, have a merry Christmas and a happy New Year.